It was a whirlwind of action up in Boston at the TD Garden this week with so much build up for the US Nationals! I loved every minute of it. The tickets were a birthday gift from my boyfriend in December and I was just so excited to finally be there. I did some indoor and outdoor skating myself while I was up there practicing my silver moves and just basically trying not to impale small children and adults alike that were clinging for dear life onto the boards at the outdoor rink in Lynnfield, MA. We happened to make it for the earlier 11am session at the indoor Peabody rink and that was very much like an adult session. They had donuts and coffee too, yum! Extra bonus! Anyone who is in the area should try that rink out if you want to really have a productive practice, it was a nice session. I will admit to being a stalker of ice rinks though, I have tried more than my fair share and continue to test them out as I travel. In addition, that same day we also happened upon “Crystal Lake” in Middleton, MA which I am told can be skated on but I was too chicken to try. It was a beautiful wintry day with the snow falling and my boyfriend and I both tested the edges of the pond ice. He actually went out to the middle where someone had cleared an area for hockey so he was a bit braver than me! The ice did look pretty solid but I am not too into testing unknown ponds for skating, only regulated rinks, thank you! Here I am doing my spiral in my boots on the pond. Ahem… I do this move at the beach, in front of buildings, at new rinks, even New Zealand! Basically any new place I can find…Weird? Ahem. So, onto Nationals! What can I say that has not been said? I’ll start with the controversial. 1. Ashley Wagner deserves her spot as the only US lady to have secured the silver and bronze in the last two international competitions as well as the 3rd spot for the ladies at the Olympics through her placement at Worlds last year. I will also freely admit to being an Ashley follower. I love her skating and have followed her career for years. Her determination and the fact that she is the only US lady that really looks like a fully packaged LADIES skater makes me like her even more. I’m emphasizing that here because over the years I keep seeing 15-16 yr. old girls hop their way around the rink at these competitions without much depth, nice lines or artistry on the ice. 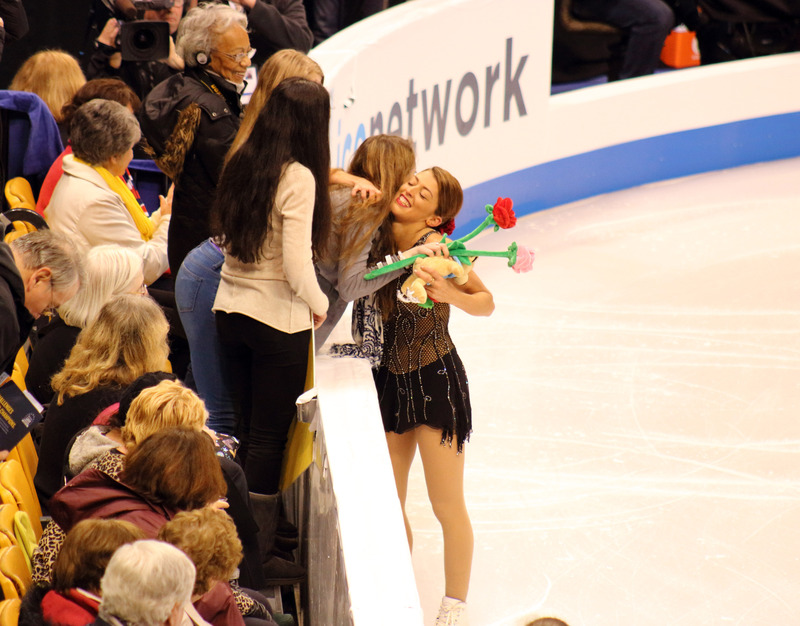 Anyone who says she doesn’t deserve her spot probably only tuned in for Nationals and has not been following figure skating for the last two years or for that matter, the last two months. ‘Nuff said. 2. Polina Edmunds. It is a complete shock to me that she is going to the Olympics. Despite the fact that Mirai does not have a coach and has not had a stellar showing the last two years does not mean you place a 15 yr old Jr. skater in her place who does not have even one Sr. competition before this to show on her record. Sorry USFSA, she is not Sarah Hughes or Tara Lipinski or even a Julia Lipnitskaya, who, by the way, all have Sr. competition experience. She needs that EXPERIENCE to even be considered for the Olympic team and yet they think she will pull out two back to back programs to compete on the world scene. All this at the expense of a 23 yr. old who does have experience, proved (despite, yes, the noticeable breathing pauses in her program) that she can compete on the world scene again at a higher level. The worst part is that this is probably Mirai’s last chance while Polina has at least 2 more chances to go to the Olympics. She is the future of skating not the present. Ridiculous decision. Absolutely.Completely. Ridiculous. I can think of other things to say but I’m going to leave it at that. It’s done and I feel badly for Mirai. She had a standing ovation from the crowd at nationals and she was so happy. It’s just mind boggling why the committee felt that they needed to give her a chance. Does this have something to do with her Russian background? Probably. That and well, duh, her jumps. In any case, I also felt badly for Ashley. She was so upset about her performance on the ice but I watched all her other competitions throughout the season and there was nothing there to feel bad about. All her grand prix performances had been beautiful and consistently executed with artistry, grace and yes, that damn triple triple combination. I do hope she is just saving the best for last, she is our most consistent skater and I think she will place in the top 6. Yes, I just said that. Watch and see. Now, Gracie. She is definitely a jumper. I will give her that. Her less than stellar record leading up to this event made me think she was going to tank but she performed. I do not think she is the full package yet. Her jumps are great but that’s about it. What am I missing? She gets the job done on home ice but will she consistently hold up on the world scene? I think we are going to see a crash and burn. Her scores were just a little inflated at Nationals and her fist pumping around the rink after the competition was nauseating and a bit overkill. She won’t be able to jump her way to the podium over Mao, Yuna, Carolina, and even Akiko Suzuki. Not to digress but I actually think Akiko Suzuki has a chance to be the stand out in this Olympics not Gracie Gold. Did anyone see her at Japanese Nationals? Amazing. Just amazing. I think she may surpass all of them and everyone will be left with their mouths hanging open. Other stand out’s at the ladies event were Samantha Cesario and Barbie Long. They both performed beautifully! Courtney Hicks has explosive jumps and Ashley Cain was so very good! Leah Keiser had some lovely positions and although Caroline Zhang did not perform well that night, it was nice to see her perform. She has a delicate grace about her that is sometimes missing in the current crop of ladies. Very reminiscent of Michelle Kwan. I’ll post some of my photos below to view and cover the mens next time aka Jason Brown and Jeremy Abbot! I have so many photos that I don’t know what to do with them right now. It will take me hours to edit them all! Did someone say OBSESSION? Yes, that would be me! Ashley at the Medal Ceremony, Sniff. Here’s to 2014 and Better Skating! I’ve been skating over the last few months a lot, indoor, outdoor, small and large rinks. We are talking about at least 3-4x times a week up until the holidays. Now that the holidays are over again, I am back to the rink! I’ve skated twice this week with another two sessions planned. A year ago this would have been a dream and now it is finally a reality. My knees while not perfect are so much better now then what they were and now that they are I can practice everything I wanted to do two years ago. This is so exciting to me! I’ve been taking lessons weekly and have been learning so much and big surprise, none of them have been about freestyle. The younger me would’ve freaked out by this and I admit, I am still dreaming about those doubles and layback spins but for now I will focus on my basic skating skills like a good student 😉 and soon I will return to lessons on beloved jumps and spins. This blog has been left to it’s own devices for a few months again and this time I am determined to update regularly. I think it’s important to keep a record of skating lessons as we go on because it is so easy to forget the details and we all pay so much for them! But back to the skate lessons, my warmup every day on ice is to stroke around the perimeter once or twice to get a feel for it and then I launch into what is essentially the pre-juv and adult bronze Forward and backward perimeter power stroking. These consist of alternating forward crossovers with a strong inside edge hold down one side of the rink, two crossovers around the end of the rink into a right inside mohawk. Then going down the other side of the rink I start alternating back crossovers with a strong back inside edge hold till the end pattern which consists of 4-5 back crossovers and then turning forward and stopping. I do that at least 5-6 times sometimes even more in a day. When I first started doing it, it was not a warm up, it was half my session! It’s not even on my test but when I first started doing them I could barely control my forward inside mohawk and my left forward crossover took me down more then once on a a session as did my first back crossovers because I neglected my underpush. I’ve been doing back crossovers for 10 years confidently however, with technique changes I struggled to change the way I did things. This move is not on my silver test but this alone has improved my basic skating skills so much that I wanted to note it here for future reference. I realize now that when I took my bronze test that I did NOT do these correctly. That may be why I barely passed that test! You should have speed and power and each crossover backwards and forwards should point you towards one side of the boards or the other never diagonal. 3 months of doing these sometimes for 15-20 min a day has made forward crossovers 10x better and faster and they will make yours better too, I promise. Just make sure you do them right aka get a coach to show you and wow, what a difference in just getting from point A to B going to do a jump or stroking. This is my base to warm up everything else for the silver moves. In one of my next posts I’ll talk about the silver moves, at least the ones that I have somewhat mastered. Exciting stuff. Yep, I know. Where has the young freestyler gone? Well, she hasn’t gone anywhere, just waiting for her chance to leap high in the air once she masters the basics! I’m chomping at the bit but holding myself back! My boyfriend bought me tickets to the Figure Skating Nationals in Boston for the Women’s and Men’s free so I hope to see some truly awesome skating to inspire me even more! I’ll be taking photos and I hope to post some here as well.